Kids and Fitness is now also, offering Surf Board Fitness for kids ages 8 and up. Surf Board Fitness is probably one of the most challenging work outs, but it is also, very fun, especially when classes are conducted in a fun and safe environment, such as the environment at KAF! 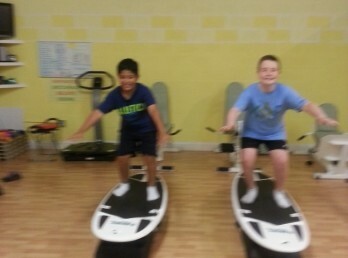 If your child does not enjoy conventional work-outs, they will surely love Surf Board Fitness. This is the way to get fit through instability training that requires your child to keep their mind and body challenged. Surf Board Fitness for kids is a high intensity interval training that helps burn fat, increase endurance, speed up metabolism and promotes strong muscles and a toned body. As you can see there are many benefits to Surf Board Fitness for kids. Best of all, your child can participate in their first lesson for free!! These classes will be taking place on Mondays and Wednesdays at 5:30pm and on Saturdays at 10:00am. Come and experience Surf Board Fitness at Kids and Fitness, your one stop fitness spot!